Accessories – Mechanical devices, such as cable clamps, added to connector shells and other such hardware that are attachable to connectors to make up the total connector configuration. Adapter – An intermediate device that accomplishes the attachment of special accessories and provides for special mounting. Angle Connector – A connector that joins two conductors end to end at a specified angle. Backplane Connector – An interconnection assembly configuration having terminals, such as for solderless wrapping, on one side and usually having connector receptacles on the other side, used to provide point-to-point electrical interconnections. The point-to-point electrical interconnection may be printed wiring. Bayonet Coupling – A quick coupling device for plug and receptacle connectors, accomplished by rotation of a cam operating device designed to bring the connector halves together. BNC Connector – Bayonet Siel-Concelmann Connector. Boot – A form placed around wire termination of a multiple-contact connector to contain the liquid potting compound before it hardens. Also, a protective housing usually made from a resilient material to prevent entry of moisture into a converter. 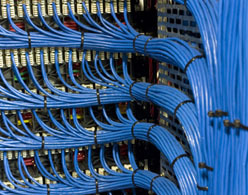 CAT5 – Category 5 cabling. CAT5e – Category 5e (extended) cabling. CAT6 – Category 6 cabling. Cable – Either a stranded conductor with or without insulation and other coverings (single-conductor cable), or a combination of conductors insulated from one another (multiple-conductor cable). Cable Assembly – A cable with plugs or connectors on each end. Cable Clamp – A device used to give mechanical support to the wire bundle or cable at the rear or a plug or receptacle. Capacitance – That property of a system of conductors and dielectrics that permits the storage of electricity when potential difference exists between the conductors. Its value is expressed as the ratio of quantity of electricity to a potential difference. A capacitance value is always positive. Certification – Verification that specified testing has been performed and required parameter values have been attained. Characteristic Impedance – The ratio of voltage to current in a propagating wave (i.e. the impedance that is offered to this wave at any point of the line). In printed wiring, its value depends on the width of the conductor, the distance from the conductor to ground, and the dielectric constant or the media between them. Coaxial Cable – A high-bandwidth cable consisting of two concentric cylindrical conductors with a common axis that is used for high-speed data communication and video signals. Complete Solder Joint – A soldered connection between a wire lead and a terminal area where the solder wets and forms a void-free fillet between the wire lead and the complete terminal area. Conductance – The reciprocal of resistance. It is the ratio of current passing through a material to the potential difference at its ends. Conductivity – The ability of a material to conduct electric current, expressed in terms of the current per unit of applied voltage. It is the reciprocal of resistivity. Conductor – A wire or combination of wires not insulated from one another, suitable for carrying electric current. Connector Block – Connector housing. Connector Housing – Insulating material, usually plastic, that encapsulates contacts. Once pins and sockets are inserted into the housing, the assembly is called a connector. (Also called a block). Connector Shell – The case that encloses the connector insert and contact assembly. Shells of mating connectors can protect projecting contacts and provide proper alignment. Contact, Female – A contact located in an insert or body in such a manner that mating contact is inserted into the unit. It is similar to a socket contact. Contact, Male - A contact located in all insert or body in such a manner that the mating portion extends into the female contact. It is similar in function to a pin contact. Continuity – A continuous path for the flow of current in an electrical circuit. Control Cable – A multiconductor cable made for operation in control or signal circuits, usually flexible, relatively small in size, and with relatively small current ratings. Controlled Impedance Cable – Package of two or more insulated conductors where impedance measurement between respective conductors is kept essentially constant throughout the entire length. Crimp Terminal – A point at which the bared portion of the hook-up wire is crimped to either the contact or a tab or pin that mates with the contact terminal. Crimp Termination – Connection in which a metal sleeve is secured to a conductor by mechanically crimping the sleeve with pliers, presses, or automated crimping machines. Splices, terminals and multi-contact connectors are typical terminating devices attached by crimping. Suitable for all wire types. Crimping Die – Portion of the crimping tool that shapes the crimp. Crimping Tool – Mechanism used for crimping. Crosstalk – (1) Undesired electrical currents in conductors caused by electromagnetic or electrostatic-coupling from other conductors or from external sources. (Also called Spurious Signal.) (2) Leakage of optical power from one optical conductor to another. (3) The introduction of signals from one communication channel into another, which often happens when cables cross each other. Current – A movement of electrons, positive ions, negative ions or holes; the rate of transfer of electricity from one point to another. Current is usually measured in amperes. Current Rating – Maximum current that a device is designed to conduct for a specified time at a specified operating temperature. DIN Connector – Usually refers to DIN 41612, the standard developed by the German Institute for Standardization, and the Association of German Electrical Engineers. It covers a variety of connector styles and is based on a family of 64- and 96- position, 2-piece PC board connectors having contact tails for soldering on 0.100 or 0.200” centers. Desoldering – Process of disassembling soldered parts in order to repair, replace, inspect or salvage them. Typical desoldering methods are wicking, pulse vacuum (solder, sucker), heat and pull, and solder extraction. Detent – (1) A bump or raised section projecting from the surface or a spring or other part. (2) A device that holds a part, control, or assembly in a given position. Dielectric – (1) Any insulating medium that intervenes between two conductors. (2) A material that, having the property required to establish an electric field, is recoverable in whole or in part as electric energy. Drain Wire – In a cable, the uninsulated wire laid over the component or components and used as a ground termination. ERP – Effective Radiated Power; Enterprise Resource Planning. Edge Connector – A one-piece receptacle, containing female contacts, designed to receive the edge of a printed circuit board and interconnect on which the male contacts are etched or printed. The connector may contain either a single or double row of female contacts. Electronic Hook-up Wire – Wires used to make the internal connections between the various electrical parts of electronic assemblies. GSM 1800 – Global System for Mobile Communication 1800 MHz. GSM 1900 – Global System for Mobile Communication 1900 MHz. GSM 900 – Global System for Mobile Communication 900 MHz. Grommet – (1) A rubber seal used on the cable side of a multiple-contact connector to seal the connector against moisture, dirt or air. (2) An insulator, usually of elastomer material, that covers the rear portion of the contacts and a short length of the incoming wire. Harness – A group of wires and cables, usually made with breakouts, which are tied together or pulled into a rubber or plastic sheath. A harness provides interconnection of an electric circuit. Hood – An enclosure, attached to the back of a connector, to contain and protect wires and cable attached to the terminals of a connector. A cable clamp is usually an integral part of a hood. IDC – Insulation Displacement Connection. ISO 9001 – ISO’s rigorous international quality standard covering a company’s R&D, design, production, installation, and service procedures. Impedance – (1) The total opposition that a circuit offers the flow of alternating current or any other varying current at a particular frequency. (2) A measure of the electrical property of resistance, expressed in ohms. Different cable systems have different resistance levels. Induction Soldering – A method of soldering in which the solder is reflowed or supplied by performs. If the work is moved slowly through the energy field, the induction process may be made continuous. Insertion Loss – (1) The loss in load power resulting from the insertion of a component, connector, or device. (2) Total optical power loss caused by the insertion of an optical component, such as a connector. Insulated Terminal – Solderless terminal with an insulated sleeve over the barrel to prevent a short circuit in certain installations. Insulation – A material that offers high electric resistance, making it suitable for covering components, terminals and wires to prevent the possible future contact of adjacent conductors resulting in a short circuit. Insulation Crimp – Area of a terminal, splice or contact that has been formed around the insulation of the wire. Insulation Displacement Connector (IDC) – A mass termination connector for flat cable with contacts that displace the conductor insulation to establish simultaneous contact with all conductors. Interface – A shared boundary; for example, the physical connection between two systems or devices, or the matching of adjacent components, circuits of equipment. The two surfaces on the contact side of both halves of a multiple-contact connector that face each other when the connector is assembled. Intermateable – Characteristic of connectors in which a connector half manufactured by one company will mate directly with a connector half manufactured by a different company. JMS – Java Message Service. Jacket – Outermost layer of insulating material of a cable or wire. Joint – The connecting point of two conductors. Lead – A wire, with or without terminals, that connects two points in a circuit. MTBF – Mean Time Between Failures. Mating Face – Synonymous with Interface. Metal – A substance that exhibits the following characteristics: High electrical and thermal conductivity, great opacity and high reflectivity for light, malleability and ductility. Metallization – A film pattern (single or multilayer) of conductive material deposited on a substrate to interconnect electronic components, or the metal film on the bonding area of a substrate that becomes a part of the bond and performs both an electrical and a mechanical function. Modular – A connector that can be assembled according to the requirements of a particular application. Modular connectors contain similar or identical sections that are fitted together to provide the required connector size and type. Molded Plug – A connector molded on either end of a cord or cable. “N” Series – A large radio frequency connector covered by military specification. Non-Insulated Terminals – As the name implies, solderless terminals without insulation. “O” Ring – A doughnut-shaped ring of rubber used as a seal around the periphery of the mating insulator interface of cylindrical connectors. Panel-mount – Method of fixing a connector half to a board, panel or frame. Usually, the female portion of the connector is mounted, and the male half is the removable portion. Patch Cable – A cable with plugs or terminals on each end of the conductor(s) used to temporarily connect circuits of equipment together. Patch Cord – Usually braid-covered with plugs or terminals on each end. Used to connect jacks or blocks in switchboards or programming systems. Phase Modulation – The process of using a medium to carry information. An electrical sine wave travelling down a twisted wire pair can also be modulated to carry information. Pigtail – (1) A short wire extending from an electric or electronic device to serve as a jumper or ground connection. (2) A short length of optical fibre permanently fixed to a component to couple power to a transmission fibre. Pin Contact – A male type contact usually designed to mate with a socket or female contact, normally connected to “dead” side of a circuit. Pitch – The nominal distance from centre-to-centre of adjacent conductors. Plug – The part of the two mating halves of a connector that is free to move when not fastened to the other mating half. Plug Connector – An electrical connector intended to be attached to the free end of a conductor, wire, cable or bundle, which couples or mates to a receptacle connector. Poke-Home Contact – Term applied to a male or female contact to which a wire has been permanently affixed prior to the assembly of the contact into the insert. Polyvinyl Chloride (PVC) – A common and widely used synthetic thermoplastic resin that can be converted by heat and pressure into colourless sheets or films. Potting – Sealing of a component (e.g. the cable end of a multiple contact connector) with a plastic compound or material to exclude moisture, prevent short circuits and provide strain relief. Press-Fit Contact – An electrical contact that can be pressed into a hole in an insulator, printed board (with or without plated through-holes) or a metal plate. Pre-tinned – Solder applied to an electrical component prior to soldering. RFQ – Request For Quote. Receptacle – Usually the fixed or stationary half of a 2-piece multiple contact connector. Also, the connector half usually mounted on a panel, containing socket contacts. Receptacle Connector – An electrical connector intended to be mounted or installed onto a fixed structure (such as a panel, electrical case or chassis), which couples or mates to a plug connector. Reflow Soldering – Method in which a solder joint is made by melting the solder coatings on the mating components. RF (Radio Frequency) – A generic term referring to the technology employed in the CATV industry and broadband LANs. Uses electromagnetic waveforms for transmission, usually in the megahertz range. Resistance Soldering – A method of soldering whereby a current is passed through and heats the soldering area by contact with one or more electrodes. Ribbon Cable – Flat cable with conductors that have been individually insulated together. Structure is usually characterised by individual colours of insulation for each conductor, although a single colour may be used for all conductors. Right Angle – A mounting position option for terminal blocks. SCSI – Small Computer System Interface. Shell – Outside case into which the insert and contacts are assembled. Shells of mating connector usually also provide proper alignment and protection of projecting contacts. Shield – Device surrounding that portion of a connector that is used for attaching wires or cables to shield against electromagnetic interference, and/or protect connector wires or cable from mechanical damage. Shielding – The metal sleeving surrounding one or more of the conductors in a wire circuit to prevent interference, interaction or current leakage. Shore Hardness – A procedure for determining the indentation hardness of a material by means of a durometer. Shore designation is given to tests made with a specified durometer instrument. Sleeve – Covering over the terminal barrel, it can be insulated or metallic. Snap-On – Used to describe the easy removal or assembly of one part to another. Socket Connector – A connector containing socket contacts into which a plug connector having male contacts is inserted. Solder – An alloy that melts at relatively low temperatures and used to join or seal metals with higher melting points. Solder Contact – A contact or terminal having a cup, hollow cylinder, eyelet or hook to accept a wire for a conventional soldered termination. Solder Cup – A tubular end of a terminal in which a conductor is inserted and soldered in place. Solderability – The property of a metal to be wetter by solder. Soldered Joint – Point of bonding between solder and component surfaces. Soldering – Process of joining metallic surfaces with solder, without the melting of the base metals. Soldering is an economical, versatile and fast termination method. A soldered connection has metallic continuity and excellent long term reliability. Solderless Connection – The joining of two metals by pressure means without the use of solder, braze, or any method requiring heat. Solderless Contact – Contact with a back portion that is a hollow cylinder to allow it to accept a wire. After a bared wire is inserted, a swedging tool is applied to crimp the contact metal firmly against the wire. Usually called a crimp contact. Solderless Terminal – A wire connection in which metal parts are crimped to the wire with crimping tools. Solderless terminals vary in size and style to meet different applications, and are said to surpass solder joints in tensile strength. Spade Connector – A terminal with a slotted tongue and nearly square sides. Straight Connector – A connector that joins two lengths of conductor end-to-end in a straight line. Strain Relief – Technique involving methods of termination or installation, which reduces the transmission of mechanical stresses to the conductor termination. Stranded Conductor – A conductor composed of a group of wires, or of any combination of groups of wires. The wires in a stranded conductor are usually twisted or braided together. “T” Connector – A branch connector that joins a branch conductor to the main conductor at an angle of 90°. 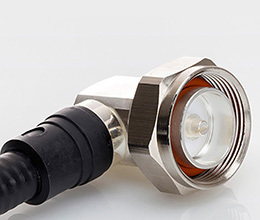 TNC Series Connector – A radio frequency connector with impedance of 50 Ω; it is designed to operate in the 0 to 11 GHz frequency range and has a threaded coupling that can be safely wired to prevent accidental disconnect. Wetting – The formation of a relatively uniform, smooth, unbroken and adherent film of solder to a base material. Wicking – Desoldering method utilising prefluxed braid of stranded wire or braid used with flux. The wick material is placed on the solder joint, and a heated iron tip is applied to the wick. Capillary action draws the solder up into the wick material.